Australian Mark Groves (he of Von Einem, Dead Boomers, Red Wine and Sugar Absoluten Calfeutrail etc. ), has recently launched this new solo project and with Dismal Fantasies being the debut album. Taking some sonic cues from Red Wine and Sugar, the minimalist construction and creepy whispered style of the vocals of that project are both replicated here. 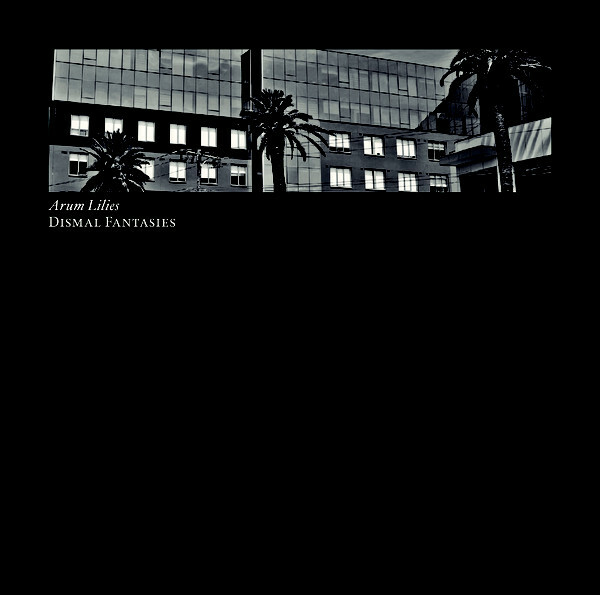 Yet sonically Arum Lilies see Mark approaching industrial noise and subdued power electronics from an experimental and almost musique concrete angle. Also, while the project moniker may seem slightly abstract at first, it starts to make more sense when it is discovered that the Arum Lily is also referred to as a funeral flower. On album opener The Maniac ,minimalist panning static and a morbid bass drone feature prior to the whispered vocals articulating lyrics of psychoanalytical type. The later introduction of maudlin piano melody shifts the mood of the track substantially, which then extends through into the following instrumental cut Erasing the Line. The layered, piecing and invasive whistling noise of Venal Dogs generates far more tensile mood, which in turn matches the lyrical dialogue which addresses a series of internalized thoughts and observations in the first perspective. * Musically speaking I find this piece one of the less successful ones on the album due to its needling and invasive textures, but this impression has far more to do with me avoiding music with tones that mirror my own long suffered tinnitus. Yet despite this personal negative, the sound shifts again on Prostituting Their Ambitions, where scrabbling field recordings and low humming drones provide the basis for fragmented one-line descriptors which gradually builds a picture of a lonely suicide. This general mood then arcs through later third of the album, with the tracks furrowing a sound frames around dour drones, minimalist sustained textures, and wonky piano elements for eerie atmospheric result. With only seven album tracks, it amounts to a relatively short album (only 38 minutes), yet stylistic diversity is displayed within that run-time. Rather than being aggressive in tone, the overarching mood is unnerving and at times harrowing, and which lyrically function to thematically articulate the malaise and underlying violence of contemporary society from a number of angles. It is also worth noting that through Arum Lilies as well as his other projects, Mark is building quite a strong body of work which is forging a divergent take on the more typical tropes of the post-industrial genre. * – During the review process I asked Mark whether the image on the back cover was associated with the January, 2017 incident, where Dimitrious Gargasoulas used a car to run down pedestrians in Melbourne Australia, killing six and injuring thirty others. That impression was confirmed to be correct and it was then highlighted that the lyrics of Venal Dogs were based prior social media posts from Dimitrious, which are very revealing as to his state of mind before the attack. Mark also revealed further conceptual inspiration taken from another notorious Melbourne crime, so for those interested, good luck in potentially working it out from cover images and lyrics. This entry was posted in 2018, Death Continues Records, experimental, industrial, noise, power electronics by noisereceptor. Bookmark the permalink.